The #BotBotsChallenge continues! 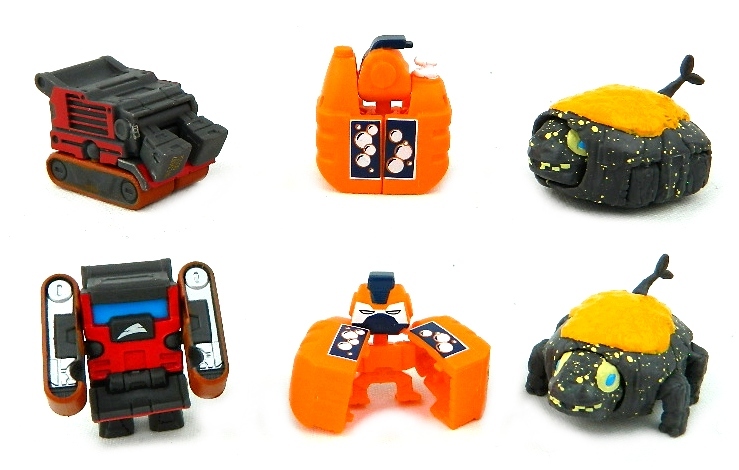 Following their explosive mini figure debut earlier this year, Hasbro’s Transformers BotBots (read my extensive Series 1 review HERE!) is set to entertain collectors with an all-new series this April. 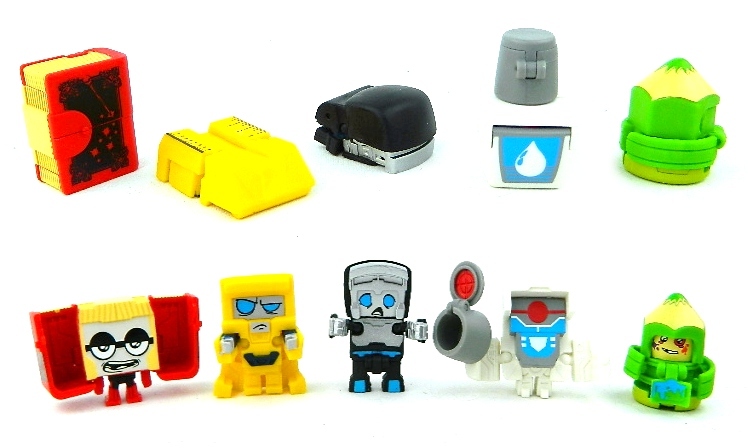 For those unfamiliar with the line (again, read my first review HERE), Transformers BotBots are Hasbro’s answer to the collectible blind packaged mini figure craze. 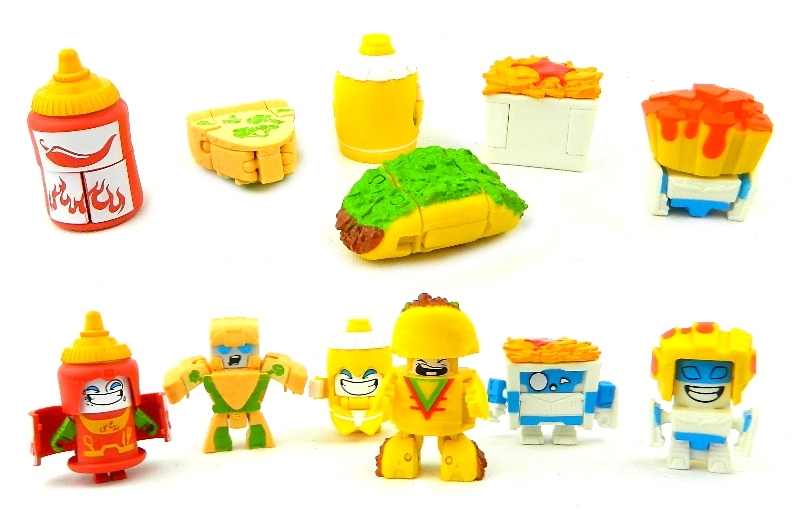 Think Grossery Gang and Shopkins, but with the mass appeal of the Transformers license. Best yet, Transformer BotBots destroy the competition because they actual TRANSFORM. 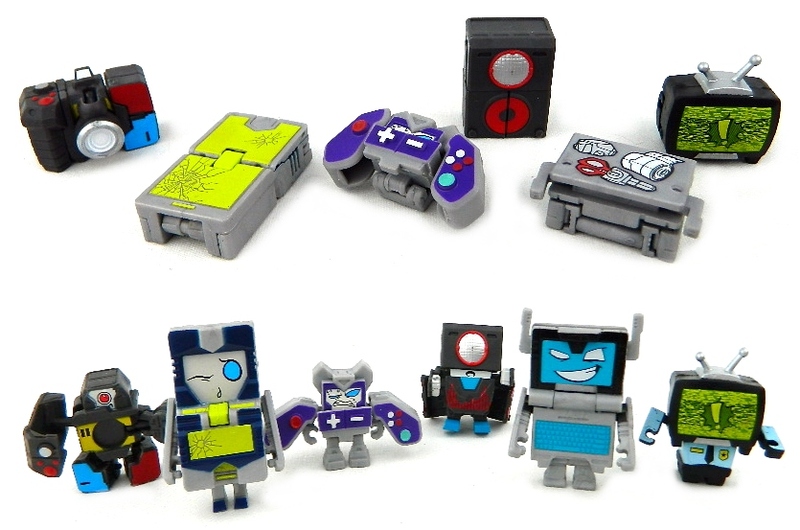 These are really fun little figures, not only in appearance as ordinary objects, but in their ingenious converting robot design. To help me share the news on Transformers BotBots Series 2, Hasbro was kind enough to send along another massive sampling of the new assortment. Unlike Series 1, Hasbro appears to have heeded my advice and eliminated the 5-packs, as NONE were included in my sample (I’m waiting on confirmation). It’s a very smart move – if true – as the blind solo packs (SRP $2.99) and 8-Packs (SRP $14.99) were the best bang for you buck. The solo packs surprise the most with rare characters and the 8-Packs allow the collector to see 7 characters right off the bat. The larger packs are also a quick and affordable way to collect these little guys. SWAG STYLERS: This new addition is hit and miss for me. The “bling” category doesn’t bother me as much as some of the debut offerings, such as Chic Cheek (a make-up brush?) and Frizzle Fry (hairdryer). Ollie Bite (a fashion snapback cap) and Prince Perfumus (perfume bottle) are more on point, and both look killer in robot mode to boot. SPOILED ROTTENS: This new category is my absolute favorite. Gross, rotting items? What’s not to love! Each character also comes across very unique, including Grumpy Clumpy (spoiled carton of milk), Big Cantuna (can of sardines! ), Atomic Freeze (not so sure on the “rotten” them here), and Sour Wing (clearly a rotten apple, complete with worm/tail!). Not pictured because of extreme rarity: Holey Moldy (a chunk of molding swiss cheese, which is ironic, because cheese is already moldy. But I get it). MUSIC MOB: This is also a clever addition, although Hasbro’s choice of musical instruments is a mixed bag. You have Dizzy Bones (a maraca, kudos for some ethnic diversity), Songwave (a Blu-ray player? ), Dumbeats (obviously a drum kit, best of the bunch), and Pink Key Pop (a portable electronic keyboard, odd, but cool). Not pictured because of extreme rarity: Grampiano (a *drum roll*… grand piano). SHED HEADS: I thought they were odd the first time around and my opinion has not changed. Here we get Grrr’illa Grimes (some kinda industrial soap dispenser? ), Sandy Man (hand sander) and Spots the Rock (another “Pokemon” like critter that I feel doesn’t belong here). Not pictured because I did not receive: Drillit Yaself (a power drill, which is cool) and Tool Bag (pretty self explanatory). SUGAR SHOCKS: Series 1 surprised with unique whimsy. Series 2, not so much as we receive a lot of repaints. 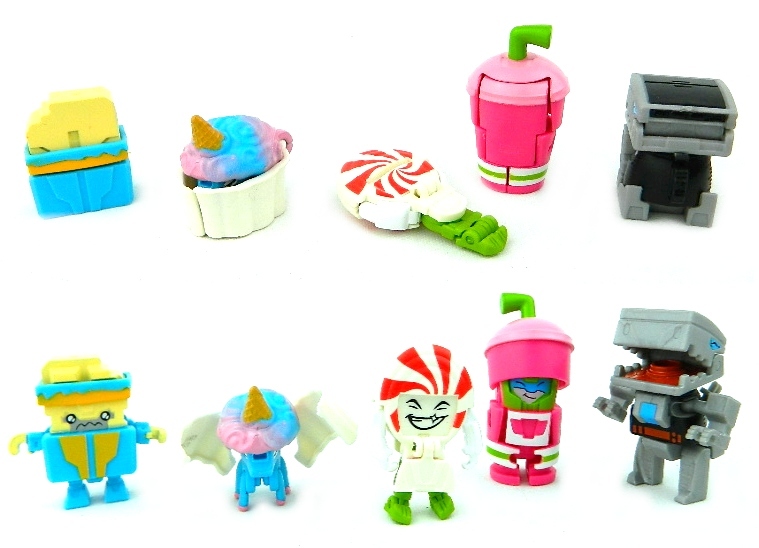 We have King Candyhooves (a cupcake unicorn, my fave, but alas a repaint of series 1’s Unilla Icequeencone ), Lolly Mints (another repaint of Series 1’s Lolly Licks), Sippyberry (repaint of NRJeez), Mocklate (not quite sure what it is), and Javasaurus Rex (a coffee machine). TECHIE TEAM: A lot of rehashes in this group as well, though I am more forgiving because these tech items at least more resemble what they are suppose to be than the first assortment. Characters include Technotic Sonic (huge old school speaker, nice), Hashtagz (no…idea), Clixx (another camera in the vein of Series 1’s S.A. Cheez), Glitchface (smart tablet), TV Cop (“Bad Boys, bad boys, what ya gonna do?” Another television set similar to Series 1’s Goob Tube), and Outtacontrol (a game controller – cool new addition). TOLIET TROOP: I don’t see this tribe lasting very much longer. There really isn’t that many interesting bathroom items to make into toys (although one wonders: where IS the toilet?). 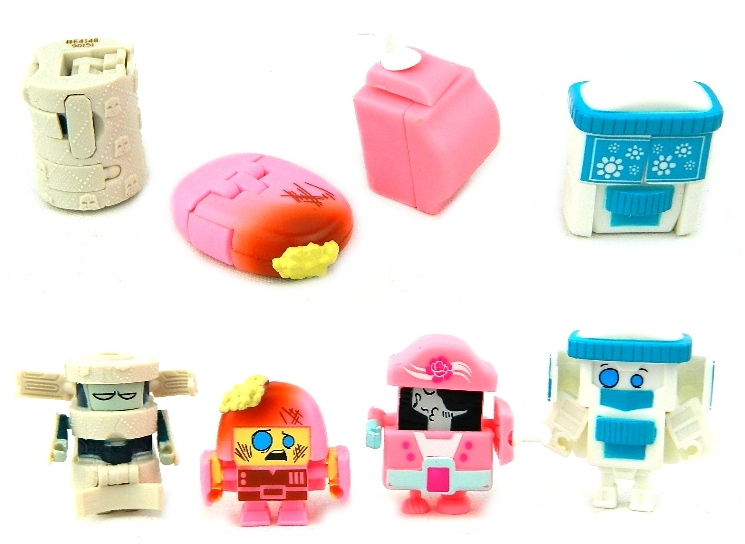 Look for Be-Oh (female underarm deodorant version of Series 1’s Nobeeoh), Captain Swoon (feminine version of Series 1’s Sudsbeard), Nope Soap (pink color variant of Series 1’s Sgt. Scrubadub), and TP Itch (see Series 1’s King Toots). JOCK SQUAD: The coolest new addition here is The In-Sole (a sports sneaker). 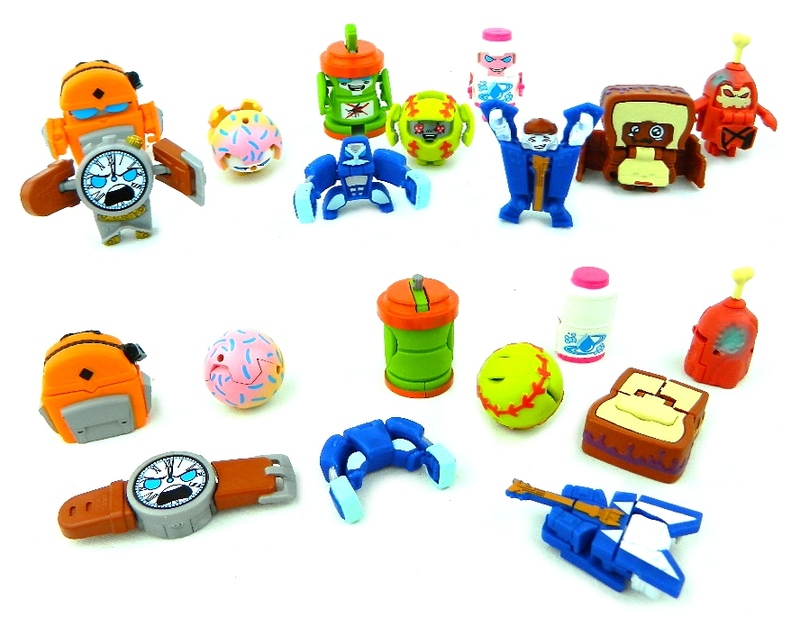 The rest are more repaints/variants of Series 1 characters, including Big Boi’ii (another baseball bat), Toughdown (a blue football), Tropic Guzzlerush (more sports drink), and the oddest of the bunch, Ice Sight (Skiing goggles, however the mold is identical to the Techie Team VR goggles from Series 1). GREASER GANG: Ah, food. Again this one of my favorite tribes only because these guys look so much like, well, food! The bright colors help too. New characters include Sir Botcha (Sriracha hot sauce! ), Hawt Mess (taco? Hot dog dressed up wrong? ), Must Turd (bottle of yellow mustard), Brotato (carton of french fries topped with ketchup), Brock Head (Broccoli pizza? If so, I HAVE had it NY City and it is very good, but as a figure? Is broccoli pizza that big of a deal nationwide? People in Alaska are like WTH? ), and Nacho Problem (Yummy, universal cheese smothered nachos!). 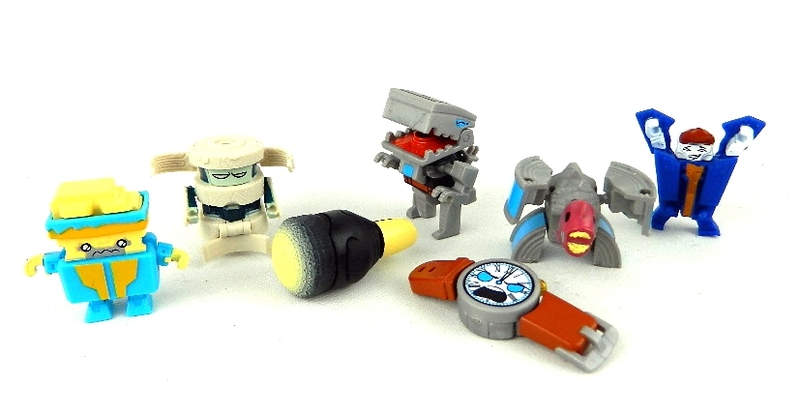 BACKPACK BUNCH: More school/ office supply items, but these guys have much more character than Series 1 did. Look for Bogus Pocus (a book, but LOVE how he opens up now), Short Edge (Eraser/ ruler? 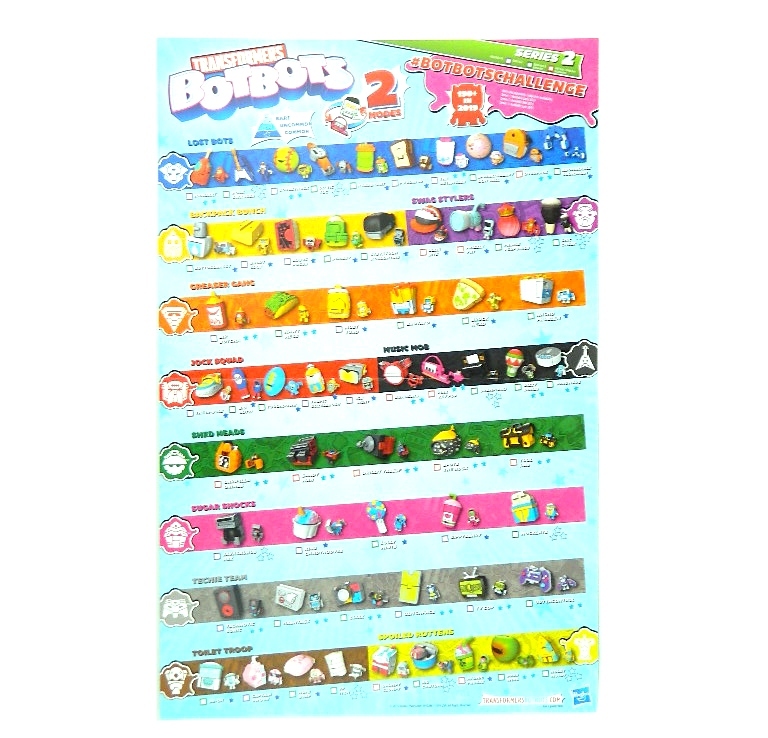 Series 1’s pink Slappyhappy in yellow), Steve from Accounting (a stapler, fun unexpected name), Scribby (pencil, Series 1’s orange Point Dexter in green), and Bottocorrect (white out/ water cooler? Whatever it is, this BotBot has a gun, which is way cool in my book!). LOST BOTS: Oh my, have the lost grown. 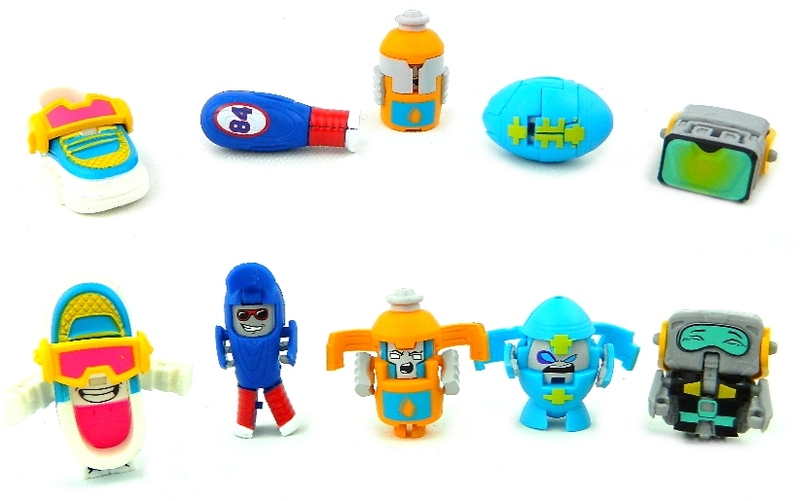 This group of misfit BotBots has expanded from 7 characters found in Series 1 to a total of TEN (10) in Series 2 to account for the three new tribes! Everything under the sun is here now, including: Hamurai (rotten chicken drum stick, oh yummy, not), Rock Swagger (electric guitar), Lovestruck (a neon green base/softball), Ol’Tic Toc (analog wristwatch), Rebugnant (no idea), PB Junior (a very bland peanut butter sandwich. Remember gang, a good PB and Jelly sandwich ratio is at least 60% jelly to 40% peanut butter), The Detangler (a hair spray product, I’m bald so…), Sprinkleberry Duh’ball ( pink frosted donut hole with sprinkles), Overpack (a backpack), and Abominable Soundman (new blue headphones). 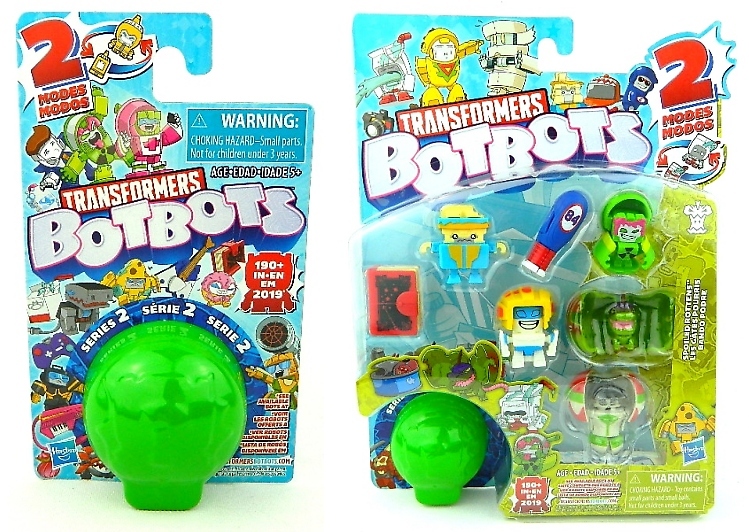 Another change to the Transformers BotBots series is the focus on rare BotBots. 10 new rare characters join Series 2 and Hasbro has made identifying these easier with a three star rating system. 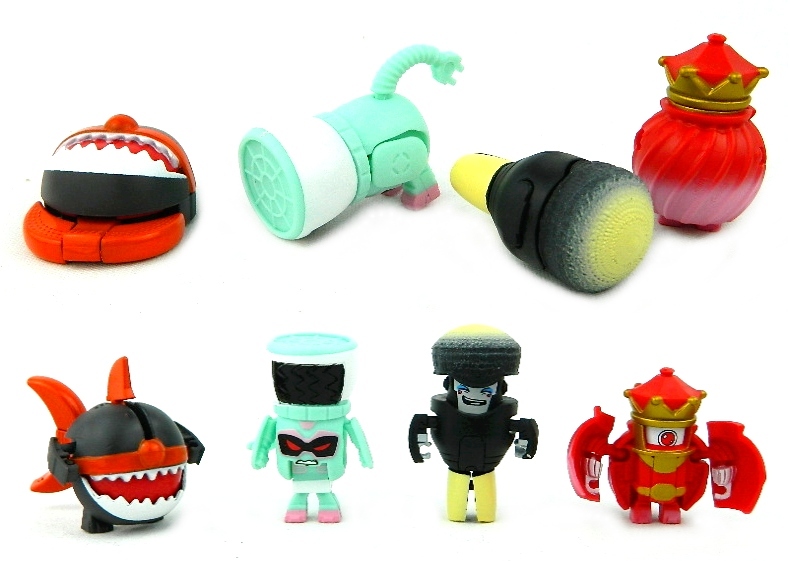 The main ones to be on the look out for include the three star rarity characters including: Lost Bot Rock Swagger, Swag Stylers’ Prince Perfumius and Chic Cheek , Music Mob member Grampiano, Sugar Shocks’ Javasaurus Rex and Mocklate, Toilet Trooper TP Itch, and Spoiled Rottens’ Big Cantuna and Holey Moldy. I’m all for rare, hard-to-find figures, but many of these in Series 2 are really cool new, unique characters that I feel everyone should have a better chance at getting. Case in point are the characters that feature all-new sculpts and transformation, such as Javasaurus Rex, Big Cantuna, Rock Swagger, Grampiano, and Ol’Tic Toc. In other words, the majority of the really hard to find characters are one’s that Hasbro put a lot of new effort and tooling into, yet most collectors aren’t gonna be able to find. It’ll build buzz within the community for sure, but not in the way I think Hasbro intended. I thin it’s going to frustrate fans. Despite on how Hasbro is handling the ultra-rares, the company has another winning series on their hands. Sure, many of the new Series 2 Transformers BotBots are repaints/variants, however visible work has been done to improve the entire line. Expanding with new tribes, while slimming down the less popular ones, keeps the line fresh. Less obvious, until you have all these new characters in your hands, is the subtle changes Hasbro incorporated with the conversion process on select characters. The spherical additions of Lovestruck and Sprinleberry Duh’ball are radically new, as is the unique way Ollie Bite transforms from baseball cap to Sharkicon, complete with dorsal and caudal (back) fins. There is also some new head turning, twisting transformation on select BotBots that I would LOVE to see continue in the line. 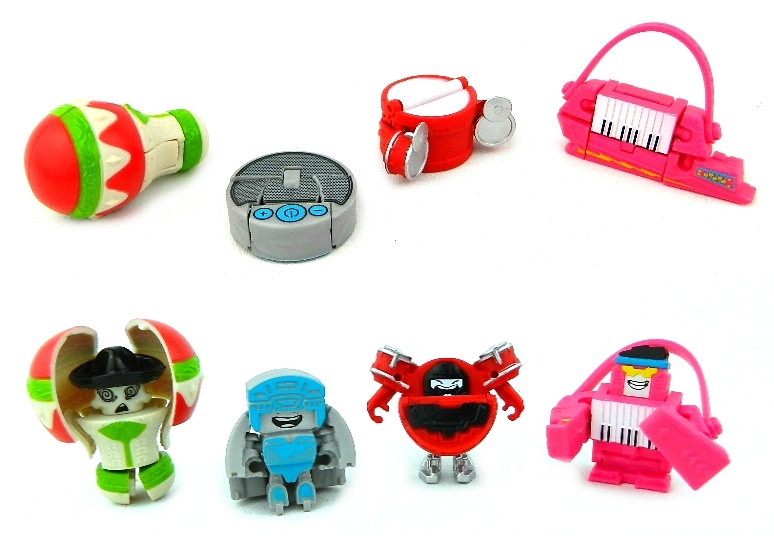 Some Series 2 BotBot’s even feature arms that pull out from the opposite direction (hands facing up as opposed to down. Small change, but different). It adds a whole new layer of unexpected conversion to the little guys which keeps the series entertaining. 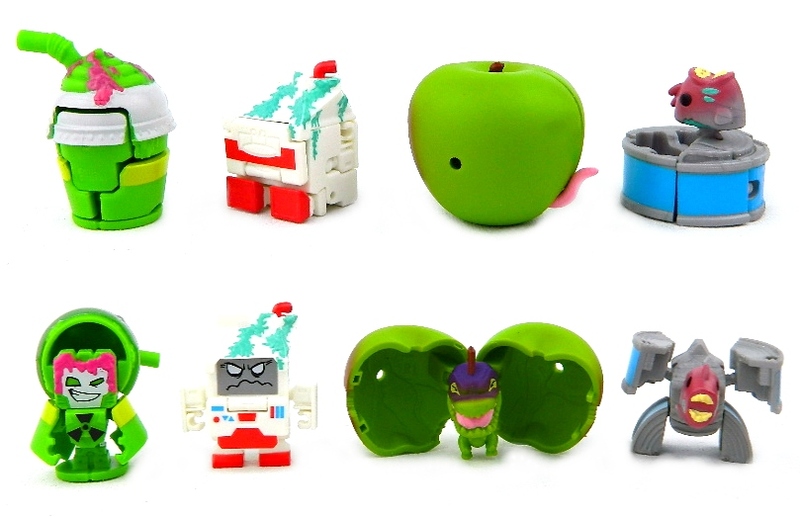 Series 2 is sure to keep Transformers BotBots fans very happy (and busy collecting them all). 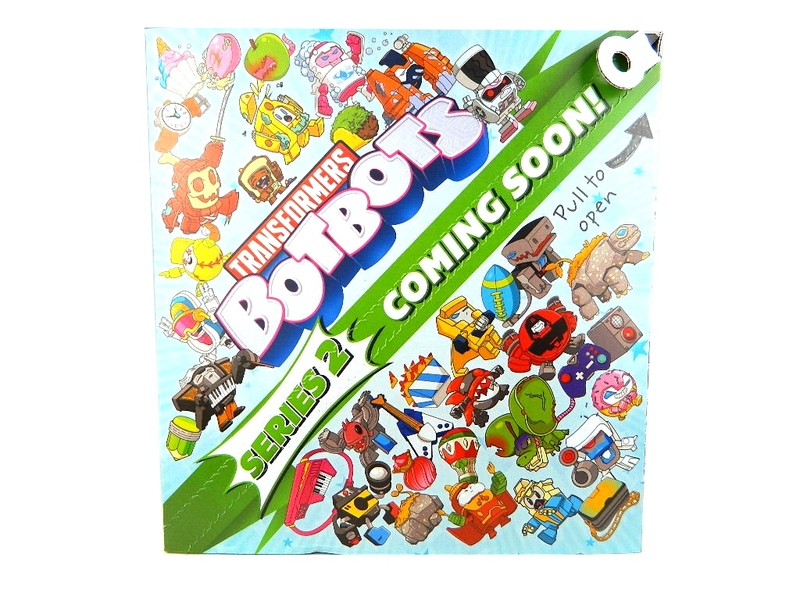 Look for them to hit retail early April with Transformers BotBots Series 3 late summer! Scroll on for more photos!